Memorial: Dawlish Memorial Inscription MORRISH FRANK CH ARMR R.N. Frank Morrish enlisted in the Royal Navy on 28 August 1893 for 12 years service, and re-enlisted on 28 August 1905 “to completion”. He was 5'4” tall, with light brown hair, blue eyes and fair complexion and was described as a coach smith. He trained as an Armourer at H.M.S.CAMBRIDGE, the gunnery training ship and after service on various ships became an Armourer's Mate in 1899. In the 1911 census Frank was an Armourer in the Royal Navy and serving aboard H.M.S.VANGUARD at Portland. He was promoted to Assistant Chief Armourer in January 1913. He joined H.M.S.DEFENCE in September 1913 and was made up to Chief Armourer. 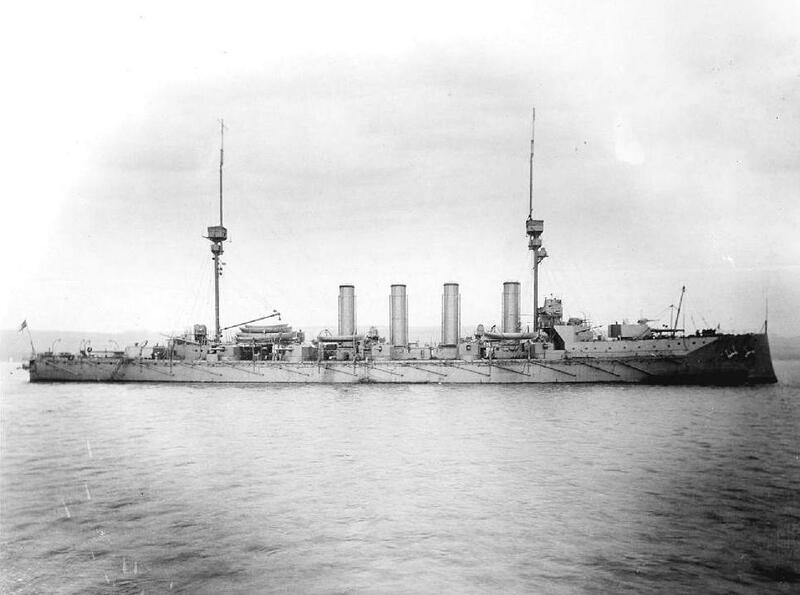 H.M.S.DEFENCE was a Minotaur-class Armoured Cruiser, launched in April 1907. She was 519 feet overall with a displacement of 14,600 tons and a speed of 22.5 knots. Her armament was 4-9.2in, 10-7.5in, 16-12pdr, 5-18in torpedo tubes. ...........Both the DEFENCE and WARRIOR had already hit the doomed WIESBADEN. Still Admiral Arbuthnot, in spite of straddling salvoes, held on till within 5,500 yards of his prey he turned to starboard. Both ships were now in a hurricane of fire, which the Germans were concentrating with terrible effect to save their burning ship, and there quickly followed another of the series of appalling catastrophes which so tragically distinguish this battle from all others. Four minutes after crossing the LION's bows the DEFENCE was hit by two heavy salvoes in quick succession, and the Admiral and his flagship disappeared in a roar of flame. 903 men were lost with the sinking of H.M.S.DEFENCE and 589 were lost from S.M.S.WIESBADEN. Frank was the oldest son of William Morrish (1847-1892, born in Crediton) and Ann (nee Way, 1850-1925, born in South Tawton) of Brook Street, Dawlish. William had been apprenticed to John Ashplant and became a blacksmith. He married Ann Way on 12 July,1871 in Bow. William was working in Dawlish in 1891, and their son Frank was working as a coachbuilder’s apprentice. Frank married Emma Louisa Woodley in December 1900 in the Newton Abbot registration district. 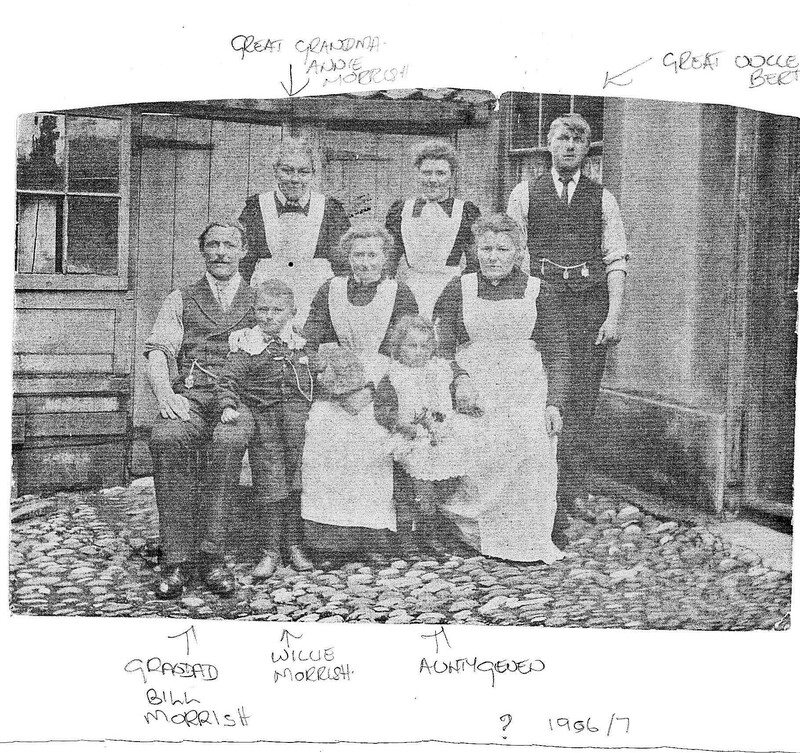 The wedding possibly took place in Teignmouth, the home of the Woodley family. Emma was the daughter of Thomas, a carpenter, and Louisa Woodley who had nine children. By 1911 Emma Louisa Morrish was boarding at 11 Commercial Road, Teignmouth with a son Frank (1905-1974 ). Frank Morrish is remembered on the Plymouth Naval Memorial, the Hoe, and on Teignmouth seafront memorial and St James' Church Memorial window, Teignmouth. Devon Roll of Honour Morrish Frank C/Armourer R.N. Morrish family photo ca 1910 with William George(1879-1947) 'Grandad Bill' , Ann (1850-1925) 'Great grandma Annie', Herbert J (1885-1937) 'Gt Uncle Bert', Gwendoline Rose (1904- )'Aunty Gwen'.